LUMOS is a new, patented book light made by LightWedge that puts all the light only on the page, with no stray light escaping in a dark room to disturb anyone else. Readers place LUMOS' flat, acrylic lens directly on the page they are reading. LUMOS uses two bright, white LED lamps that do not get hot or need to be replaced. Four AAA batteries provide readers with 40 hours of nighttime reading. The Harry Potter LUMOS Book Light includes seven interchangeable on/off switch covers featuring favorite Harry Potter icons such as the Golden Snitch, Harry's owl Hedwig and Harry's wand. Soft Cases for storing the LUMOS when not in use, embroidered with each of the Hogwarts house crests, are also available for fans. The Harry Potter LUMOS Book Light will be popular with young readers everywhere and with parents hoping to spread the magic of nighttime reading to their children. 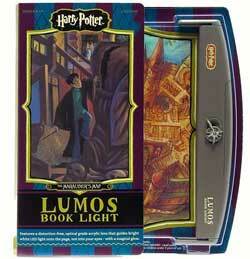 The new Harry Potter LUMOS Book Light will cast a spell on Harry Potter fans of all ages. Fred's Head Database -- Fans of Harry Potter are scrambling to get the new Harry Potter LUMOS Book Light.